Earn up to 7,495 reward points. A standalone music production and DJ performance system. 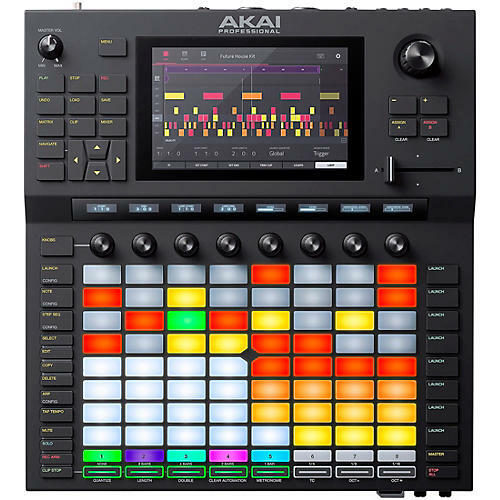 You may decide to ditch your laptop for good after you get your hands on the Akai Professional Force standalone sampler and sequencer. But combined with Ableton Live on your computer, Force becomes one of the most powerful music production systems available. On its own, you have command over powerful sampling capabilities (with real-time time stretching and pitch shifting), looping, four built-in synth engines, clip launching, step sequencing, and even DJ functionality. And Force is also ready to integrate with your favorite hardware, with CV/Gate and MIDI connectivity. Complete with over 10GB of sounds and the ability to import your own samples via USB, SD card, or even a SATA drive, the Akai Force is one of the most comprehensive standalone music production systems ever created. Force delivers a comprehensive DAW-like experience, complete with deep sampling and sequencing capabilities from the MPC series. Record your own samples and loops directly via the audio inputs, or import them via USB or SD card. You can even expand Force’s capacity with your own SATA drive. Real-time time stretch algorithms and auto bpm detection make syncing samples and loops fast and easy. You can even import multiple stems and sync them to the same bpm for instant mashups. With its highly playable 8 x 8 matrix, its vivid 7" multi-touch screen, and built-in synth engines, the Akai Force is a powerful tool whether you’re producing in your studio or performing onstage. Within Force are four impressive synth engines developed by AIR Music Technology. They offer deep editing capabilities, giving you access to everything from bass, leads, and plucks to pads, soundscapes, and effects. Play them in real time via the velocity-sensitive pads or an external MIDI controller, if you prefer. Or sequence them with the piano roll. Either way, you can apply the onboard arpeggiator at any time or switch over to Note mode to access intelligent chord, progression, and scale options. If you’re already producing music with Ableton Live DAW software, the Akai Force is the perfect addition to your workflow. Everything you do with Force in standalone mode can be saved as an Ableton Live Set and exported to Live for further production. And because it’s compatible with Ableton Link, you can connect Force to your wireless network and sync your project with any Ableton Link–compatible software or hardware, including Akai’s MPC series. On top of all that, Force is also a stellar controller for the drums, instruments, and clips within Ableton Live itself. Order today and double the pace and quality of your electronic music productions.